It's the third meeting between Moon and Kim â" and the first to take place outside of the "truce village" of Panmunjom, on the border. Their agenda centers on two large goals: creating more ties between the two Koreas, and making progress in talks over North Korea's denuclearization. "Upon arriving to the airport in Pyongyang, President Moon and his wife, Kim Jung-Sook, [were] greeted by North Korean leader K im Jong Un and his wife, Ri Sol Ju, on the tarmac as part of an official greeting ceremony. Crowds lining the tarmac cheered wildly and waved flags of a unified Korea." Photos from Pyongyang showed Moon and Kim viewing a military honor guard at the airport â" and then Moon gave Kim a ride from the airport in his Mercedes-Benz, which had been specially modified to add an open roof over the back seat. Moon isn't the first South Korean pre sident to visit Pyongyang. 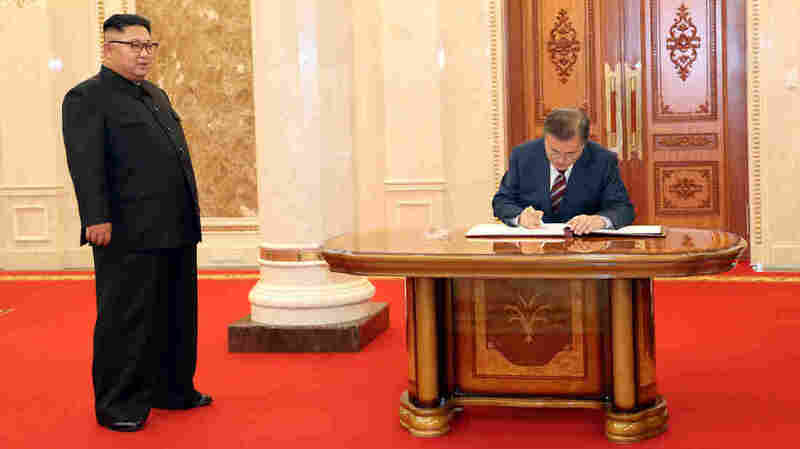 Kim's father, the late Kim Jong Il, hosted two different South Korean presidents for summit sessions at the capital in 2000 and 2007. Moon and Kim's motorcade was essentially a parade, drawing crowds of thousands of well-dressed people who celebrated Moon's ar rival. 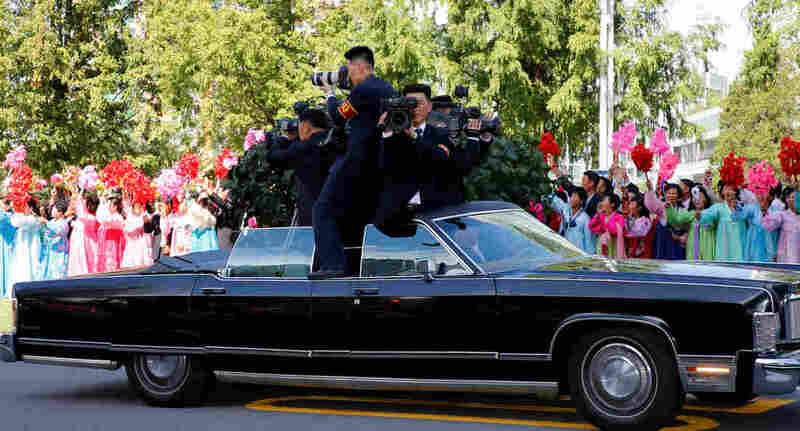 In the middle of it all, a carload of North Korean cameramen was positioned to capture every moment. Photographers and cameramen from North Korean media document the motorcade of South Korean President Moon Jae -in and North Korean leader Kim Jong Un as it travels through Pyongyang, North Korea.